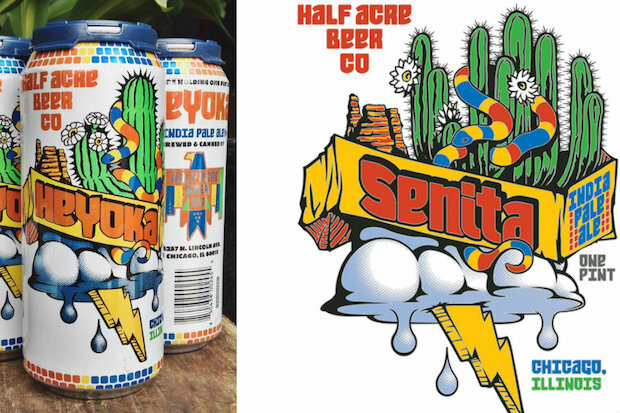 By Patty Wetli and Mark SchipperHalf Acre has renamed its Heyoka India Pale Ale brew after receiving complaints from members of the Native-American Lakota people. The brewery's founder Gabriel Magliaro said the name change for the "hugely popular beer" was motivated by outreach from "dozens" of members of the Lakota community who found use of the word in this context offensive. "I’m not sure who exactly got word of it in the community, but it was a pretty effective initial onslaught of reaching out to us in a lot of different ways," Magliaro told DNAinfo. "We were able to have a lot of very positive conversations, and it was actually just as much positive feedback ... [as] there was initial concern or negative comment." By Simon Moya-Smith"What a heyoka is ... is a healer," a Lakota elder who asked to remain anonymous told ICTMN. The elder requested to be unidentified because heyokas--thunder beings--are, themselves, publicly unidentifiable, he said. They cannot tell people they are heyoka. "Nobody is supposed to know who we are. That's why we wear the mask," he said. "[We] see the world with different eyes. [We] don't walk in balance; [Heyokas] walk out of whack because [they are] tasked with seeing the world as it is--out of whack. ... The word translates to 'sacred clown'." Walter "Greywolf" Ruiz told The Chicago Tribune that to name a beer 'Heyoka' is highly offensive given the impact of alcoholism in Indian country since Europeans first introduced alcohol to North American indigenous communities. "Heyoka is a very, very important figure and very sacred," Ruiz told Josh Noel of the Tribune. "Considering the devastation alcohol has caused for [N]ative people, it was a slap in the face. It was like naming a beer after the pope, or Jesus beer. "Comment: Another failed attempt to link Indians who represent wildness and savagery with alcohol. If it isn't obvious, being contrary is a mild form of being wild. It's the same sort of counterculture, anti-authority message embodied in Indian-skull t-shirts and hipster headdresses. Be bold and contrary and drink Heyoka India Pale Ale, even though you're not supposed to! An extra demerit for the Heyoka container art that shows cacti. Lakota and cacti? No, the Lakota don't live out in the desert, far from civilization, where they practice their contrary cultures and religions.